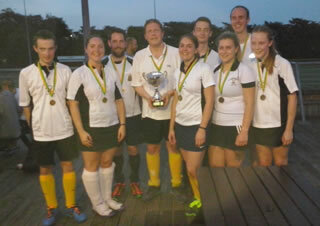 Following last years victory at the Player's Mixed Summer 7's, WB have done it again! Comiserations to key players Suzy, Robyn and James W who missed out on the last night celebrations. Great team effort all round, and some great entertaining hockey. The fact that everyone who played either scored or assisted several of the 30 goals scored durng the competition proving the strength of our teamwork. Thanks to Player's HC for organising another great competition, which was played in the right spirit throughout.